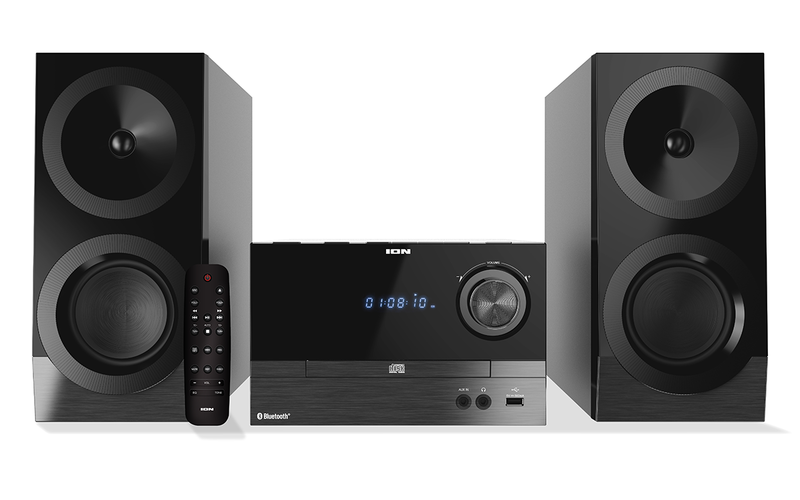 Enjoy superb hi-fidelity sound, plus the convenience of wireless streaming! Modern conveniences can be great, like streaming tunes from your phone to a wireless speaker. But nothing beats the fidelity and visceral impact of CDs played on a real high fidelity music system. The music comes alive and captures your attention and imagination in a way that it just can’t through a little wireless speaker dock with 2-inch speakers. Sometimes, it’s great to have a few hundred watts on tap powering some real high-quality stereo speakers. On the other hand, the days of cluttering up your living space with ugly, bulky stereo components are over, thankfully. You certainly don’t want refrigerator-sized “tower” speakers and a stack of complicated electronics with so many knobs and dials that it that looks like the cockpit of a jet airliner. That’s what makes the Compact Shelf System™ so ideal. Like its name says, this is a compact system with clean one-knob styling that fits anywhere and looks great. But make no mistake—this is a real, no-excuses high fidelity music system. It has lots of power and great-sounding speakers with unmistakably smooth, rich, lifelike sound. It plays virtually any music disc format, has a sensitive FM tuner, and inputs for connecting any other equipment you have, such as cassette decks and line-level turntables. Plus, it has all the modern conveniences you’ve come to expect: It streams music from any Bluetooth®-enabled device (now you can give that little speaker dock to the kids!) and there’s a USB port for playing MP3 and WMA files from a memory stick. You can control everything with the included remote control from across the room. This is the perfect mix of superb high fidelity sound with every modern convenience you demand, all in an attractive and affordable package.